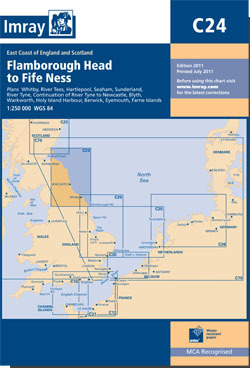 Passage chart of the east coast of England from Flamborough Head to Fife Ness. Five-minute gridlines. Scale: 1 : 251.700. Larger scale plans of Holy Island harbour, Eyemouth, Berwick, Warkworth, River Tyne, Blyth, Seaham, Sunderland, Whitby, Hartlepool, River Tees and Scarborough. Tidal stream diagrams. For this 2014 edition the chart has been fully updated throughout using revised depth surveys where possible. Whitby harbour developments and the operational Teeside wind farm are also now shown.